Rediff.com » News » The 2017 UP election sentiment meter is here! The 2017 UP election sentiment meter is here! 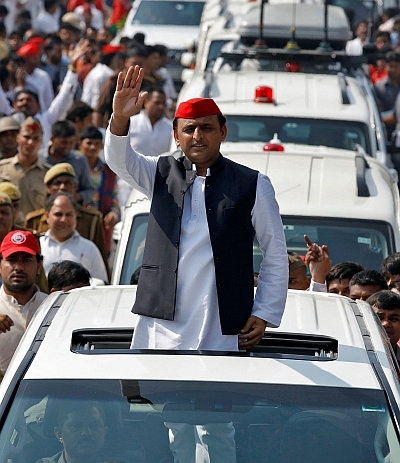 The major players in the 17th Uttar Pradesh assembly election, scheduled to be held from February 11 to March 8 in 7 phases, are the Samajwadi Party, Bahujan Samaj Party, Bharatiya Janata Party and the Congress. In the 2012 election, the Samajwadi party secured a majority (202 are needed) in the 403-member assembly and formed the government. This time around, the Samajwadi Party has entered into an alliance with the Congress while Mayawati's Bahujan Samaj Party and the BJP are contesting alone. Rediff Labs analysed the 2012 UP election results to develop a Sentiment Meter for the 2017 electoral battle (above). We also analysed the 2012 assembly election results and merged it with the 2014 Lok sabha election results to develop yet another Sentiment Meter (below). A mathematical model is used to calculate how seat distribution will be altered as sentiment/percentage of votes towards a contesting political party changes. Based on the change, each constituency is marked with the winning party. A swing represents that the victory margin is close to the runner-up party. Are digital transactions in India really safe?